One of the most common problems that Android users encounter is apps being killed in the background. This ugly problem can rear its head in many ways. You’re multitasking between a few apps and suddenly one reloads, losing your place. Or an app you rely on to run in the background just stops working. Whatever the case may be, this is a problem on many Android devices. The Pixel 3, for example, recently received an update to fix some of these problems. Users are affected by this issue, but developers have to deal with it as well. When apps don’t work correctly, developers are the ones who hear about it. In the case of phones killing apps in the background, there’s not much the developer can do. If the user doesn’t go through the hassle of whitelisting the app from “battery optimizations,” the app won’t work correctly and the user may give the app a bad review. Our own Navigation Gestures app has suffered from this and it’s very frustrating. Some developers are attempting to band together and fight this problem with Don’t Kill My App website. Nokia has the worst rating, according to the website. 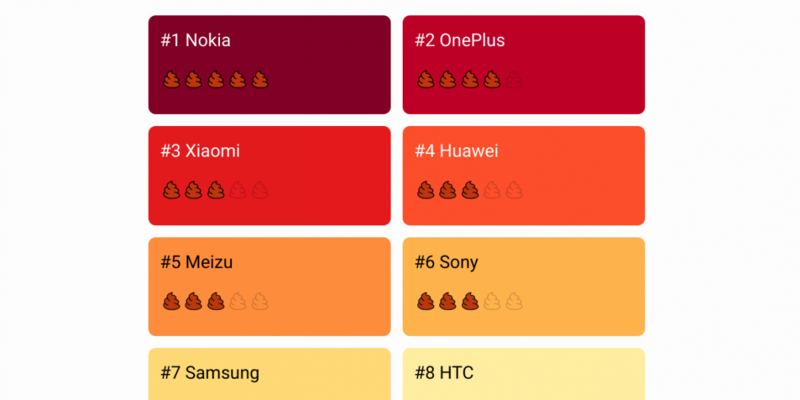 It says Nokia devices on Android Pie “kills any background process including sleep tracking (or any other sport tracking) after 30 minutes if the screen is off.” OnePlus also has a bad rating, while HTC and Stock Android were found to be the least offensive. Check out the website below to see how your phone rated and learn how to fix the issue. Source: Don’t kill my app!